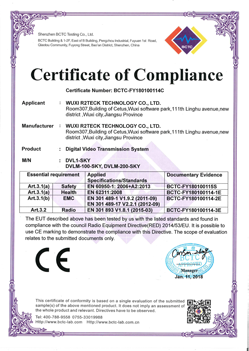 Company Overview - Wuxi R2TECK Co., Ltd.
Wuxi R2TECK Co., Ltd was established in 2015, R2TECK is a high-tech company specializing in UAV Full-HD digital and image transmission system development. R2TECK now is leading the Full-HD image transmission technology is credited with an excellent experienced in-house research and development team as well as benefited from win-win co-operate with the lab of many higher institutions such as Southeast University, Harbin Institute of Technology and Jiangnan University. Meanwhile R2TECK focuses on the way to perfect the production process and achieve the mass production. Three Foundation co-invest in R2TECK. Customer first, Reputation first - R2TECK take this as our long-term business philosophy; Achieve to the most competitive company of the UAV full-HD image transmission system is every R2TECK people's goal. R2TECK is located at Wu Xi National Software Park, warmly welcome both here and abroad friends to contact with us, sincerely hope the cooperation will altogether win creates the future!